Size (inches): 5.75" X 1.97" X 1.38"
This is a Phytoestrogen rich, topically applied product that absorbs excellently and has great moisturing properties. It contains the precursors to progesterone (Diosgenin) that assists the body. Unlike other products that use powdered root, only At Lats Naturals is made from fresh whole Mexican Wild Yam Root that undergoes a complex six-week extraction process. This exclusive process insures that freshness and potency are at their peak. What is the difference between At Last Naturals 10% Wild Yam Cream and the 12% Extra Strength Gel? Both of these products are easily absorbed. Results have shown that the cream is an effective alterative for most women. The extra strength gel is recommended for more stubborn menopausal problems. With all these choices available what is the best choice for me? Depending on your needs, either the phytoestrogen rich Wild Yam Cream or Wild Yam Extra Strength Gel can be a very effective choice. However, if your progesterone levels are low, then EQUIGEST would be the right choice. Both the Vaginal Moisturing gel and Meno-Herbs are excellent supplements to these products and can be used regularly. How soon do you feel the effects of the At Last Naturals Products? Results on the topical cream and gel can be experienced immediately or in up to two months depending on the individual. Every At Last Naturals Product is developed according to the highest standards of excellence. At Last Naturals Products are dedicated to improving general health and wellness by combining the principles of natural healing with the benefits of modern science. Our goals are simple: each At Last Naturals Product must be effective for its purpose, safe to use, of desired assayable potency and derived from the most beneficial high quality natural source. Massage 1/4 to 1/2 teaspoon into the soft parts of the body; including the belly, breasts, inner thigh and upper arm. Rotate area of application daily for maximum benefit. Wild Yam Extract, Aloe Vera Gel, Glycerin, Oleth-20, Carbomer, Triethanolamine, Methylparaben. We are glad you made the choice to read this information to learn about menopause and the choices and alternatives that are now available to women. Every day thousands of women enter into a new season of life known as menopause; a biological milestone that signals the end of the menstrual cycle and the completion of the reproductive years. It is imperative that women learn as much as possible regarding choices available, conventional wisdom, natural alternatives and exactly how best to successfully manage their personal experience. This is a wonderful, spiritual time in a woman's life. A time to aspire to the belief that "Joy in Life is a Question of Balance" will be the first step to superior health and understanding during your journey into menopause. To overcome the symptoms of menopause, almost 30% of women seek medical intervention. For almost 20 years, physicians have routinely prescribed Estrogen Replacement Therapy (ERT) for this purpose. In the mid-1970's studies linked the use of synthetic estrogen with an increased risk of uterus health issues. Scientists found that the addition of synthetic progesterone (progesterone or progestin) could protect women against uterine issues. The combination of estrogen and progesterone became the preferred treatment. Provera, the most frequently prescribed brand of synthetic progesterone was developed to regulate the menstrual cycle and increase fertility. However, the FDA has never approved it for treatment of menopause. No long-term studies have been conducted to determine the safety of long-term use of synthetics. It is important to question your healthcare professional to fully understand the pros and cons of this or any type of therapy on your road to balance. Wild Yam has been used by many cultures for over 2,000 years. In Chinese medicine it was first mentioned in the Pen Tsao Chine in 26 B.C. In the 1800;s, Lydia Pinkham's tonic for women had many of the herbs that are found to be most effective for menopausal complaints. 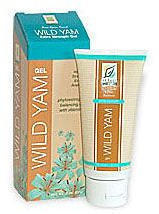 Wild Yam was in the original formula along with other phyto-chemically rich herbal extracts. In the 1940's, the scientific community discovered Wild Yam. An article published by Professor Russel Marker showed progesterone and estrogen could inexpensively be synthesized from diosgenin, the active constituent found in the Wild Yam Root. Until then, production of these was based upon costly multi-step extractions from animals. Today, Wild Yam has gained notoriety as one of the best natural sources of phytohormones. The use of Wild Yam can offer the user an alternative with no side effects or toxicity unlike the prescription counterparts. Now there are a number of natural alternatives for relief. Women can naturally and safely balance their bodies and their feeling of well-being by utilizing natural progesterone (from Wild Yam and/or soy) and Phytoestrogens that occur naturally in plants and herbs. Now, more than ever you can face Menopause with confidence. Phytoestrogens are molecules that mimic the body's own estrogen. These plant estrogens in potent form and combination can help support the body's natural functions and help to alleviate many of the symptoms associated with Menopause and PMS> Phytoestrogens can naturally help maintain the estrogen and progesterone balance of the female system. Natural Progesterone is another choice that women have. It has been proven to be an effective and safe way to help balance the body. The choice to use natural progesterone is an excellent one. However, it is suggested that you know your progesterone levels prior to making it part of your daily routine. Diet, exercise and attitude are all part of the equation in your quest for balance. Eating a diet of whole foods (organic preferably) that are cooked and consumed in a peaceful environment can have a profound effect on a menopausal woman's health and therefore her experience. Certain cultures with diets rich in soy and phytoestrogens exhibit few if any symptoms related to PMS and Menopause. The role of diet is an extremely important factor on the road to balance. Exercise has been proven to be one of the most effective ways to help alleviate many menopausal symptoms. With age, exercise becomes increasingly important. A simple daily walk can do wonders to help. Exercise strengthens bones, relieves stress and induces deeper sleep. PMS, like Menopause, is caused by a progesterone and estrogen imbalance. The symptoms associated with PMS may vary from Menopausal symptoms, but relief can be realized by utilizing some of the same natural alternatives. "At Last there are choices." At Last Naturals was one of the first companies to research and develop natural alternatives for managing menopause and PMS. Our line of products developed by women, for women, is based on the philosophy that "Joy in life is a question of balance." To achieve balance, there are a number of choices that may be perfect for your individual needs. Bennett, M. "Wild Yam - Natures Source of Phytohormones" Vista, CA, Optimal Healthspan Publications, 1997. I have a human body. I have the senses of the body. and things around me I learn my lessons in life. That is the nature of the human condition. Joy in Life is a Question of Balance!.